Basketball can be a healthy activity, one that increases stamina, strength and coordination while also promoting teamwork. Like any sport however, basketball has its disadvantages. Injuries are more common in high-impact sports such as basketball, which can stress the muscular-skeletal system, when compared to low-impact exercises such as swimming and walking. Due to the height of the net, basketball also puts short athletes at a disadvantage to taller athletes. 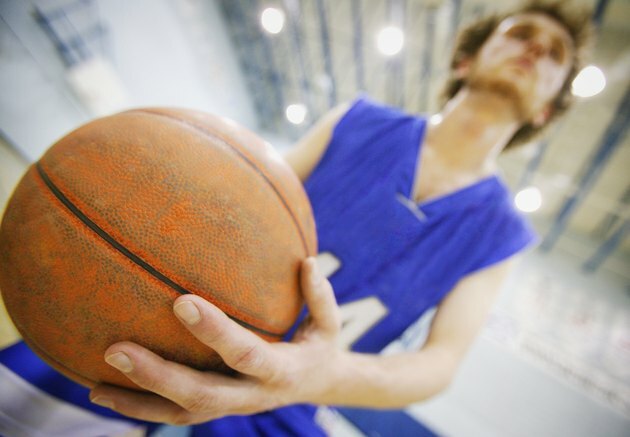 Injuries generated from sudden force are known as traumatic injuries, and may include jamming a finger against a basketball or pulling or tearing a muscle. Jammed fingers vary in their severity. The injury may be limited to swelling and tenderness, or the ligaments -- which connect the muscles to the bone -- may rip. A jammed finger may need to be iced and taped to a splint or, in severe cases, x-rayed and treated by a physician. Reduce the incidence of muscle pulls and tears by stretching and warming up before playing basketball. Overuse injuries are caused by repetitive actions in one area of the body. Patellar tendinitis, or jumper's knee, is a common overuse injury in basketball. This condition is caused by an inflammation or injury to the patellar tendon, the tissue that connects the kneecap to the shin bone. Playing on an injured knee can worsen the condition over time and may warrant surgery. Running, jumping, dodging and ducking -- basketball requires plenty of sudden movements. Spraining an ankle is the most common basketball injury, according to certified strength and conditioning specialist Adam Friedman. Spraining your ankles regularly can result in a buildup of scar tissue that restricts motion in the ankle, leading to stress in the knees, hips and even the lower back. Abstain from playing basketball on a sprained ankle, even if the sprain is minor, and follow the treatment recommended by your doctor. There's no denying that basketball favors tall players over short players. According to Forbes, the median height in the NBA is 6 foot 7 inches, and even those players are at a disadvantage to players that are 7 feet tall. Height is an unteachable asset, as a relatively unskilled but taller player can often block an opponent's shot just by standing near the basket. This can be a seemingly unfair and frustrating aspect of basketball for shorter athletes. Hughston: Common Basketball Injuries Keep Your Guard Up! Forbes: NBA Draft: Is Being 7 Feet Tall the Fastest Way to Get Rich In America? What Is the Purpose of a Basketball Sleeve?